Glory bower is a much branched, straggling shrub, 1-2 m tall. Terminal branches very often twining slender, twigy, dark green and form dense bush on the river banks and river slopes. Leaves ovate to elliptical, 5-10 cm long, acute to acuminate tip, green, smooth, slightly shiny upper surface, margins entire, leaves opposite, simple. Cymes or umbels usually comprised of 3 flowers joined at a common base point. 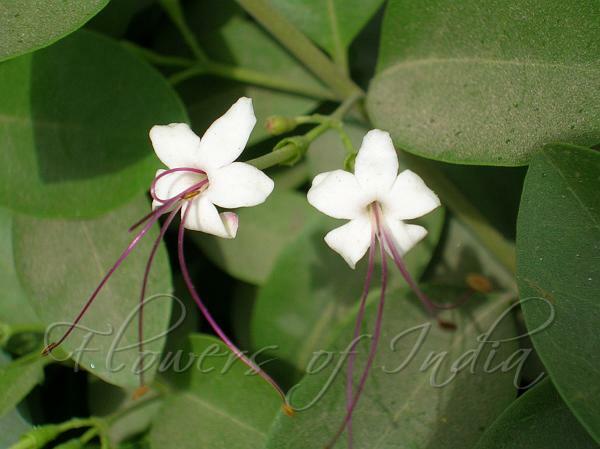 White flowers with a 3.5-5.5 cm long narrow tube ending in 5 petals. Four purple stamens, 1.5-3 cm long, protrude out of the flower. The plant is tough - akes trimming well, and hence, is commonly used as a hedge plant in India. It also grows well on the beach, tolerating all the salty water sprays. Within India, it is found throughout particularly near coastal regions. Flowering: November-January.